“What are you doing this afternoon?” my husband asked. This would make sense to my husband. He is accustomed to sharing me with the voices in my head. I remember a blog post (or an answer to an Anon on Tumblr?) where Maggie Stiefvater was talking about copying your favorite writers — literally rewriting their sentences (not for publication in any form or fashion) as a writing exercise. Now, I am pretty sure she did not use the word exercise, that is likely my paraphrase, but the thought is that by studying the sentence structure, word choice, rhythm, and so on by the actual writing of their words you could illuminate why it works, and learn how to apply that in your own writing. I never did this, but I like the idea. It’s the saying, “Imitation is the sincerest form of flattery” but for writing. And as I read Blue Lily, Lily Blue, I knew there was something I needed to learn from this book. From the purposefulness of her words. From what she showed me, versus what she told me. I have gotten to a point in revision that requires more. So I read. And I felt and I felt and I felt. I am a vocal, passionate fan of Maggie’s writing, and I am always surprised when another reader does not share my enthusiasm for her stories. Subjectivity is the name of the game, and this is why I am not arguing with another reader, pointing out their wrongness. I am going to make a case now for why her writing in particular strikes this cord in me, because it may surprise you with it’s threefoldness. Words have to read a certain way in my head heart. I think (and I am not a scientist or scholar) we read to the inherent beat of our own hearts, so certain kinds of prose can feel wrong to a reader not because they are badly written, or uninteresting, but because they hitch in our heartbeat, so they hitch in our heads. Writers write in the voice of a narrator, but we bring our own voices with us, filtering out our personality, but retaining our uniqueness. This is why anyone can write sentences on paper, not everyone is a writer. I am going to talk about a massive best seller that I have nothing against, in fact, I very much see it’s merit. Marie Lu’s Legend was super challenging for me to get through, and I never really fell in love. And I knew I wouldn’t from page one. Why? Cadence. My rhythm and her narrator’s rhythm could never sync up. This does not make it a bad book. It makes it a less me book and a more for someone else book. Books are not meant to please all readers — they are not popcorn. They are not pumpkin spice lattes. They are the opposite of basic. However! 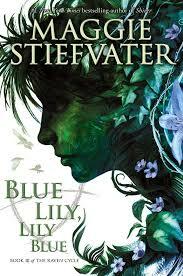 Maggie Stiefvater writes words in a way that flows through me like music. I do not have to acquaint myself with her rhythm when I open one of her books. And, don’t get me wrong, I love many books that do not follow my beat, but this is about why I love HER writing so much specifically. Her writing follows the beat of my heart. I am a frustrated actress who still secretly (busted) dreams of performing. Writing is acting without a stage. Reading is an extension of this, so the first thing I look for in a story is character. Maggie Stiefvater is a fabulous storyteller, in the most true, classic sense of this word, and some of that is because she gets that character is the base from which all good plot is built. Character defines world. Character creates voice. And characters should be alive. I am of the opinion that powerful characters (not characters with power, or characters in a place of power) are conjured from our own selves, deep observation of other people, deep questions we are asking without asking, and magic. I say magic because to create is a magical thing. And Maggie is a bit of a magician. Reading her books is really living with her people. Getting to know them, making bargains with them, losing their bets, celebrating their glory. Gansey thought of how strange it was to know these two young men so well and yet to not know them at all. Something Maggie does in Blue Lily, Lily Blue over and over (intentionally, and likely not fully understood yet) is repeat this kind of phrasing, from different points of view, as if promising us that we will never know any of these people completely because they are people, and people are always revealing new layers, manipulating perspective, changing opinions, and so we should not get comfortable, not assume anything. And this is what I believe in life, and this is what I want in stories. — Educational. You should learn something about yourself, your sense of humor, your own questions, your own darkness. And yes, you can learn all these things reading genre fiction of all sorts. — Entertaining. Reading is not popcorn, I have already said this, so it is also not a movie. It may take work to entertain yourself with a book. It will take imagination. But reading should fuel your mind and emotions, which means it should not make you wish you were cleaning the kitchen instead. We all have different barometers for this, yours is none of my business. —Satisfying. When you close a book you may want to throw it against the wall, if you were given no promise by the author that the book would make you feel fuzzies, or if you were looking for something to bring out those emotions, you should feel satisfied. Satisfaction is not happy endings. Happy endings can also be satisfying. Reading a Maggie Stiefvater book is like voyeurism. Sometimes, it is looking in a mirror. Almost always it is frustrating and thrilling and big. I need this to feel educated, entertained and satisfied. So, I can get this from other books, but I know I will get this from her books. She is not obligated to deliver this to me, and I am not obligated to always agree with the choices she makes as a writer. But when she publishes a book, I have learned to expect a certain chipping away of my own soul while reading. I have learned to believe her capable to telling me the truth. So. I needed to learn something from Maggie’s book. And I did. I learned I must be willing to get in the head of a particular character that I have resisted, and why have I resisted, because he will charm me and then he will really have power. And that is dangerous because of who he is. Maggie Stiefvater writes books only she could write, which makes them more polarizing and less easily digested, but do yourself a favor and spend some time with the Raven Boys and Blue on their quest for a dead Welsh king. Oh, I am so glad to hear I am not the only one who fixates — sometimes subconsciously — on cadence. You will LOVE Blue.